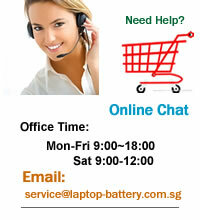 Welcome to laptop-battery.com.sg. High quality Replacement Laptop Batteries, Notebook Batteries are 30 Days Money Back, 1 Year Warranty! There is no sales tax for any orders ( No Commercial Value). How can to ship the batteries to third party? Sending products or gifts to third party is easy. During the checkout process, just add the appropriate "Shipping Address" or you can just to send us an email order@laptop-battery.com.sg & request the "Shipping Address" which different as the paypal. It is that easy! The information practices of PayPal, Inc. have been reviewed and meet the standards of the Better Business Bureau's BBBOnline Privacy Program. Note: This seal indicates that PayPal is a member of the BBB Online Privacy Program and in no way reflects any relationship a seller that uses the PayPal service may have with the Better Business Bureau. With PayPal, you’re protected against unauthorized payments sent from your account. PayPal sends an email confirmation of every account transaction. If you receive confirmation of a transaction you don’t recognize, our 24/7 customer support team will help you sort out the situation. Dispute resolution on PayPal purchases. A physical good that you paid for but never received. A physical good you purchased that is significantly different than what was described in the listing. Dispute Resolution specialists gather information about your transaction and help you resolve the issue. Throughout the process, you’ll be advised of your claim’s status via email and on your Account Overview page. Singapore replacement Laptop Batteries for Acer, Apple, Asus, Dell, HP, IBM, Compaq, Samsung, Sony, Toshiba and so on with warrantable high quality.